I decided to lose my VMware ESXi server set-up as, with my latest employment, I simply don't need the technology and I don't have time to use it at home for now. So, I've got this machine (see here and here) freed up on which to set up my new Plex Media server and want to do a RAID 1 thingy. I'll have to see what I can make of it all. This was some early work on documenting ZFS. Don't pay too much attention until the "practical" stuff that illustrates some horsing around I did before settling on a final approach, documented in Setting up tol-eressëa. Really, really good treatment. I may just follow this guy's write-up and skip the head-scratching. mdadm is at least as old as 2005. Not sure this is the road I want to walk. Anyway, even if it did a good job and wasn't hard to manage, my first disks were all of different sizes and useless for RAID 1. With RAID 0, the RAID controller tries to evenly distribute data across all disks in the RAID set. Envision a disk as if it were a plate, and think of the data as a cake. You have four cakes—chocolate, vanilla, cherry and strawberry—and four plates. The initialization process of RAID 0, divides the cakes and distributes the slices across all the plates. The RAID 0 drivers make the operating system feel that the cakes are intact and placed on one large plate. For example, four 9Gb hard disks configured in a RAID 0 set are seen by the operating system to be one 36Gb disk. RAID 0 can accommodate disks of unequal sizes. The advantage of RAID 0 is data access speed and viewing several disks as one filesystem. A file that is spread over four disks can be read four times as fast. RAID 0 is often called striping. Data is cloned on a duplicate disk. This RAID method is therefore frequently called disk mirroring. Think of telling two people the same story so that if one forgets some of the details you can ask the other one to remind you. 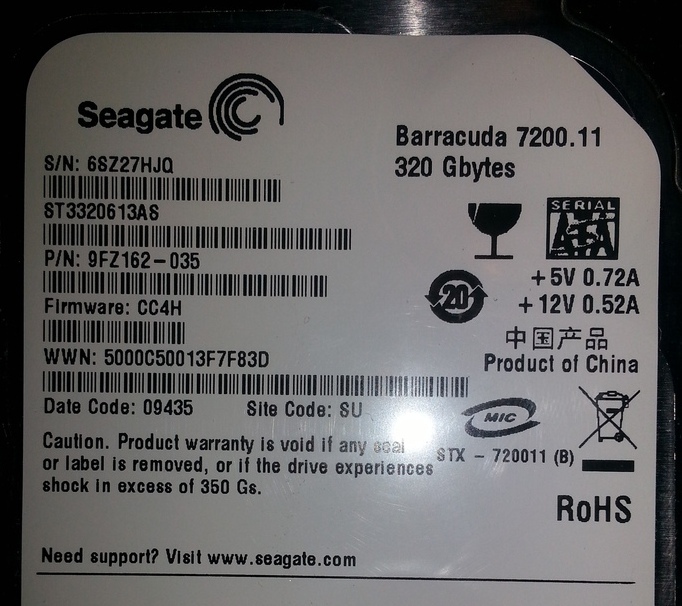 A limitation of RAID 1 is that the total RAID size in gigabytes is equal to that of the smallest disk in the RAID set. Unlike RAID 0, the extra space on the larger device isn't used. Operates likes RAID 0 but inserts a special error-correcting or parity chunk on an additional disk dedicated to this purpose. RAID 4 requires at least three disks in the RAID set and can survive the loss of a single drive only. When this occurs, the data in it can be recreated on the fly with the aid of the information on the RAID set's parity disk. When the failed disk is replaced, it is repopulated with the lost data with the help of the parity disk's information. RAID 4 combines the high speed provided by RAID 0 with the redundancy of RAID 1. Its major disadvantage is that the data is striped, but the parity information is not. In other words, any data written to any section of the data portion of the RAID set must be followed by an update of the parity disk. The parity disk can therefore act as a bottleneck. For this reason, RAID 4 isn't used very frequently. 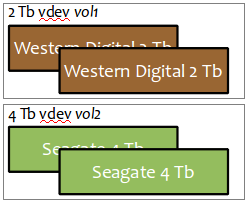 Improves on RAID 4 by striping the parity data between all the disks in the RAID set. This avoids the parity disk bottleneck, while maintaining many of the speed features of RAID 0 and the redundancy of RAID 1. Like RAID 4, RAID 5 can survive the loss of a single disk only. Here are some resources I resorted to through this process. A hands-on introduction to zfs pools using a bunch of thumb drives. What to call ZFS vdev that won't change? 1.9 How do I set up the /etc/zfs/vdev_id.conf file?. I elected not to much with this, but just use /dev/disks instead. zfs is a highly scalable, future-proof filesystem and logical volume manager designed around the concepts that a) data integrity is paramount, storage administration should be simple and c) everything can be done on-line. We're setting up zfs, the special filesystem that will allow me to mirror each of the two drive pairs (2 Tb and 4 Tb), then group them together as if one big 6 Tb drive. The idea is that if an drive goes bad, its mate will still have all the data on it and the system doesn't skip a beat. I will just need to buy a new drive of the same size and replace the bad on before the surviving one ever goes bad. Here are the Ubuntu stable release of zfs. However, this page is not meticulously helpful. Please follow these instructions instead. The native ZFS filesystem for Linux. Install the ubuntu-zfs package. This PPA contains the latest stable release. As I'll want to upgrade zfs when necessary, I elected to create /etc/apt/sources.list.d/zfs.list with these contents. The command to install zfs is here; it takes a very long time (in excess of 10 minutes), there's lots of installing prerequisites, linking, etc. This is listed as a step for Linux installations by an article I read. Apparently, we must limit zfs' advanced replacement cache (ARC) to an appropriate value otherwise it's too slow to release RAM back to the processor and will starve system memory. The article advises setting it at one-half of the total system RAM. In our case, this is 8 Gb. As it has to be in bytes, there's a comment that gives several useful values. This is done in /etc/modprobe.d/zfs.conf. Here's mine; this file didn't exist before I created it. # yes you really DO have to specify zfs_arc_max IN BYTES ONLY! I plan on rebooting to make this value effective. After reboot, I see this confirming that I successfully established the maximum number of bytes the ARC can monopolize at any given time to 8 Gb. By zfs, data stored is on one or more vdevs (virtual device), which may populate one or more higher-level vdevs. In my case, I predict something like the illustration below, we'll see how well I understood as we go. A vdev can be a single, physical drive or even partition. In my case, the lowest granularity will be a physical drive. Or, it can be a higher-level concept consisting of multiple drives or partitions. We'll use something called a zpool to subsume the 2 mirrored vdevs into a RAID10 array logically mapping the 2 Tb and 4 Tb vdevs into one 6 Tb entity. vdevs are immutable: once created, they cannot be added to. zpools are not: I can add more mirrored vdevs to my pool as needed using zpool add. What's important in the behavior of a zpool is that the system will try to fill up the vdevs in a balanced way as much as possible. To see the zpool status, do this. (The wwn-... stuff is fictional for now.) As implied, each vdev will contain the same percentage of data as the other. In my case, for 4 Gb of data written, zfs will try to put roughly 1.3 Gb on (2 Tb) mirror-0 (the Western Digital pair) and 2.7 Gb on (4 Tb) mirror-1 (the Seagate pair). Before attempting a zpool, let's get a list of the drives the system thinks it knows about. The other stuff looks similar to the wwn- designations in the sample zpool status I copied from the article. I also recognize sda, sdb, ... sde. The article tells us that drives can be referred to multiple ways, a) by wwn id, b) by model and serial number as connected to the ATA bus, c) ditto as connected to the virtual, SCSI bus. The article says that the best designation to pick is one reproduced physically on a label on the physical drive. When one goes south, I'll want to be able to identify it, pull it out, then replace it. I'll have to decide this soon. On my 320 Gb drive, the wwn designation is clearly visible, but the shortest designation is the model plus serial number. Maybe that's best to use. For this, I had to resort to different resources because the first article, although a really fine one, only mentioned mirroring, but did not show how to set even a simple case up. That article was really good for explaining, useless for showing. Then I thought to combine those two vdevs into a pool. It appears that instead of building from the ground-up, zfs was designed to build from halfway up the ladder down, then off to the side. Clearly object orientation wasn't in the minds of the conceivers. I'll have to deconstruct everything I've done and start over. Now the right commands seem to be these. Notice how, instead of creating both bottom-level vdevs, we instead create the pool with unnamed vdevs we declare and mirror at the same time. We could do this all in one command, but I've used the add option to allow me to do it in two commands. Finally, we make zfs tell the filesystem about it. First, let's create pool aquilonde with our first pair of mirrored drives. So far, so good. Next, we'll add the second pair of mirrored drives. The last step in setting up a zfs pool is to fix up the naming so that when a drive goes bad, it's not too hard to correlate the observation that a drive is bad with the physical piece of equipment that is the drive. The last practical step is to instantiate the pool in the host's filesystem. Check out the command, the result and the diskspace now available to Plex. This is mirrored space! I need to test out the mirroring, but so far, it's the sweet smell of success. Despite the extreme convenience of having both mirrors united together as one volume in my host filesystem, it occurs to me that copying a movie to that volume would result in zfs striping it across both disks (and their mirrors) robbing my disks of their autonomy. So, I'm destroying the pool and making two pools again, the larger for television episodes and the smaller for movies. I choose the bigger volume for television series because they seem to take up more space quicker. 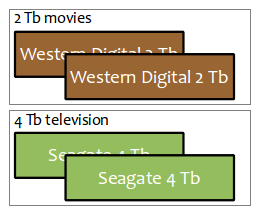 So, still in brown for the smaller disk and, therefore, movies while in green for television shows. Here's the map I made of the disks after system installation and before zfs. The order of these is logical and also the order you see, top to bottom, in the photo above. Now, before I used zfs, yet with all the disks connected and turning, here was the output of a number of a number of commands. There are errors here associated with the two, brand new 4 Tb disks that have never had anything on them.